Map by Penny Yi Wang (SJNN Fellow Cycle 2), text by Kari Lydersen. Clinic clients, advocates and AFSCME Council 31, the union that represents clinic staff, allege that hundreds of clients have “fallen through the cracks” after the clinic closures. The public health department referred clients to either remaining public clinics or other mental health providers – private and county institutions. 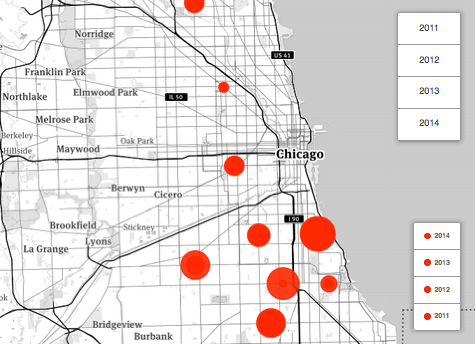 Data obtained from the Chicago Department of Public Health through Freedom of Information Act requests and represented on this map show that at the time of the closures, there were 2,798 clients in the public mental health clinics. Then 429 of them were referred to external providers, and 2,362 went to the remaining public clinics. Of the 429, 63 later returned to the public clinic system. The total client load at the public clinics has dropped each year since, and by September 2014 there were a total of 998 clients in the public clinics. See the Pen PwBBqG by Penny (@pennywang) on CodePen. The department declined to provide a breakdown of how many clients were referred to different external providers, citing privacy concerns under the Health Insurance Portability and Accountability Act (HIPAA). The department provided a list of about 50 providers to which clients were referred. The list includes hospitals, nursing homes, neighborhood clinics and non-profit organizations, including Thresholds, Trilogy, HRDI and C-4. However the provider names were incomplete (including “89 Western” and “Pilsen”) and lacked addresses or contact information. That information was not provided upon follow-up requests. The city tracked clients who were sent to external providers for two months after the clinic closures in 2012. The department has not kept further records about those clients. Nor has the city tracked the people who left the city system between the closures and September 2014, a total of 1,365 people. The department declined to specify to which public clinics clients from closed clinics were referred, citing HIPAA. In interviews, multiple clients of the clinic in Woodlawn, the site of a high-profile occupation, said they were referred to the Englewood and Greater Grand clinics. The Englewood clinic shows a significant increase in client load in January 2013, following the closures. But by January 2014 the client loads at both Englewood and Greater Grand have dropped significantly. In response to Freedom of Information Act requests the Chicago Department of Public Health also provided data on staffing levels at each clinic since 2011. In January 2012 before the closures, there were 97 total staff at the clinics. As of January 2015 there were 47 total staff. The number of clinical therapists across the system has fallen from 49 in 2012 to 24 in January. The number of psychologists has remained constant at six. While the number of total staff equates roughly to the drop in total client load, the drop in number of psychiatrists in the system has been precipitous. In response to a FOIA request, the department noted that there were 14 psychiatrists filling 11 full-time-equivalent (FTE) positions in 2006. That number dropped steadily and at the time of the closures in 2012, there were eight psychiatrists filling 5.5 FTE positions. Today there are two psychiatrists filling 1.5 FTE positions. The department notes that they have budgeted for six FTE psychiatrists, but have been unable to fill the positions. “The national shortage of psychiatrists has led to historic vacancies in CDPH,” said the department in its FOIA response.